Answering Machine Detection, often called AMD, enables you to determine if a human, answering machine or fax machine has picked up an outbound voice API call and tailor your call flow accordingly. Twilio's Public Beta Answering Machine Detection system is powered by an algorithm trained on thousands of call samples. We have tuned the system defaults to balance recognition speed and accuracy, but also provide a way for you to tune the performance of the engine based on your use case, via optional API parameters. AMD is priced at $.0075 per call. Please see the following API parameters for configuring AMD on your outbound call. Use Enable if you would like Twilio to return an AnsweredBy value as soon as it identifies the called party. This is useful if you would like to take a specific action (e.g. connect to an agent, play a message) for a human but hang up on a machine. If you would like to leave a voicemail on an answering machine, specify DetectMessageEnd. In that case, Twilio will return AnsweredBy immediately when a human is detected but for an answering machine, AnsweredBy is returned only once the end of the greeting is reached. If both SendDigits and MachineDetection parameters are provided, then MachineDetection will be ignored. The number of seconds that Twilio should attempt to perform answering machine detection before timing out and returning AnsweredBy as unknown. The number of milliseconds that is used as the measuring stick for the length of the speech activity, where durations lower than this value will be interpreted as a human and longer than this value as a machine. The number of milliseconds of silence after speech activity at which point the speech activity is considered complete. The number of milliseconds of initial silence after which an unknown AnsweredBy result will be returned. 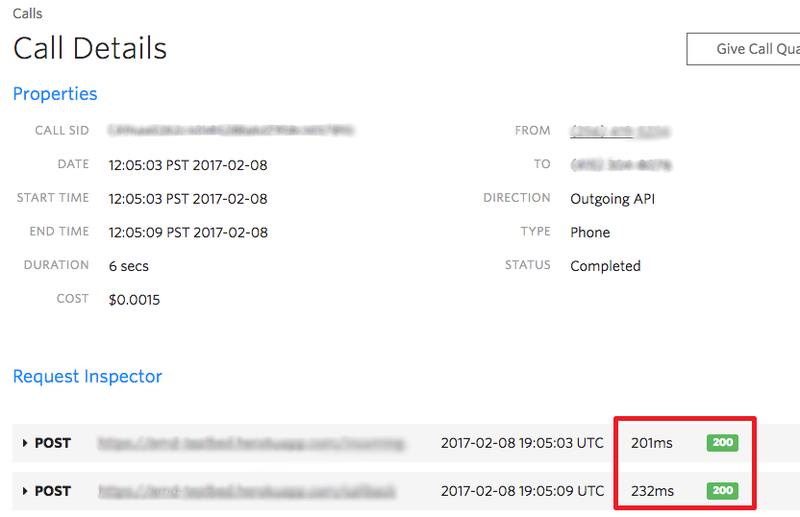 AMD results are returned in the AnsweredBy parameter of the webhook issued to the URL you provide in the outbound call request. AnsweredBy The result of answering machine detection. Answering Machine Detection will be charged at $.0075 per call where enabled and the called party picks up. Busy or Failed calls may engage our AMD system but will not be charged. Our Public Beta Answering Machine Detection solution is not backwards compatible with our legacy solution, IfMachine. It accepts different POST parameters and AnsweredBy returns different values. IfMachine is considered deprecated and will be removed from the documentation.